. Published on September 24, 2016 . I’ve never run much. In my 20s, I was in to cycling to an insane degree. I was going on super long randonneur rides (the longest was 320km in one day, sunup to sundown), I was building bikes, I was writing about bikes, it was a huge part of my life. Since I was never crazy about cycling on icy streets, I never rode much in winter while I was in Toronto, so I would occasionally jog. 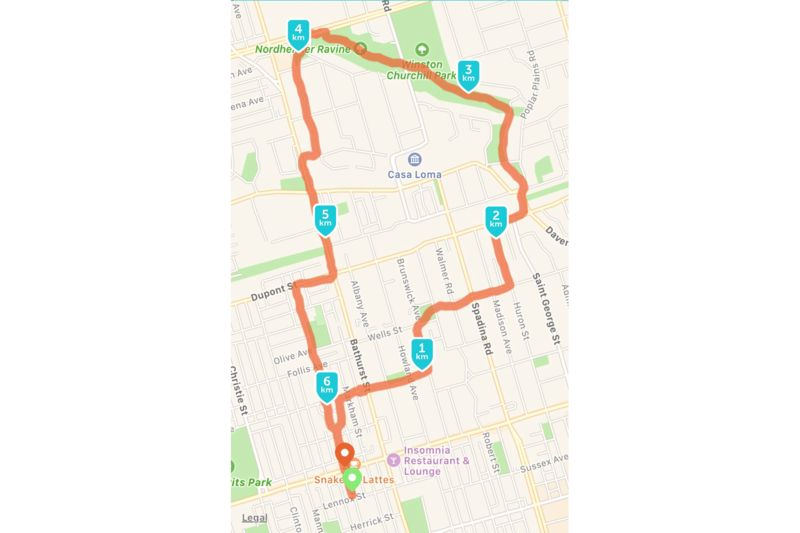 I would do a really nice loop from my house in the Annex up to St. Clair and back. It would take me around 35 minutes, which I know because I always (every single time) listened to Amy Winehouse’s Back to Black album on my iPod, and that’s how long that album is. Looking back, I can say I was probably a somewhat decent runner back then (I was probably running about 5:00/km or 8:00/mi), but I definitely wasn’t thinking of myself as a runner. I was a cyclist waiting for Spring. In my 30s, I haven’t been particularly fanatical about any sport. I ride my bike less and less, for two reasons. First, because I got a bit tired of making bikes, and my love of cycling was always closely linked to a fetishistic attraction to bikes as physical objects. Second, M. worries about my safety, and I got worse and worse at making that argument — especially in San Diego, where the cycling infrastructure is non-existent and drivers are totally unused to dealing with bikes and where I constantly see cyclists getting hit by cars. A few years ago, I started swimming. I like it up to a point, but I am very aware of not being very good at it, which makes it a lot less fun for me. Swimming is a pretty amazing San Diego sport — the pool at SDSU is insanely great: you can swim outdoors in the sunshine in salt water in the middle of winter in your own lane with no one to bother you. But as pleasant as that is, I’ve never been all the way in on swimming. Somehow, this summer I got interested in running. I remember two things suggesting the idea. First, I was in BMV bookstore on Bloor Street one day in late May, shortly after I’d arrived back in Toronto. I was browsing a shelf when I picked up Haruki Murakami’s What I Think About When I Think About Running (horrible title, I thought — and shame it’s about a sport I can relate to). I opened the book randomly to a page where Murakami was talking about how running allowed him to eat Dunkin donuts and drink Sam Adams beers without feeling guilty or gaining weight (he was living in Boston at the time). While I am not a fan of either Dunkin donuts or Sam Adams beer, I was starting to get a little chubby from lack of regular physical activity, so that was an appealing thought. There was also a line something like, “A real runner runs 250km per month.” I can’t read something like that without feeling like it’s a personal challenge, even if it totally doesn’t apply to me. I wasn’t even thinking of myself as a fake runner at this point. A few days later, I was at a Blue Jays game with my good friends Nick and Erin, who were visiting from Victoria. They mentioned how they went for runs together every morning. Given my previous failure to get M. interested in cycling (quite the opposite was achieved, indeed), that vision of exercising while hanging out with your significant other sounded really nice. I filed it away. The other thing was that I was going to be traveling for a lot of the summer — I was going to be writing travel pieces on the Baltic, the Mediterranean, and Monaco, and also attending a conference in Poland and visiting relatives there — so I wouldn’t be able to count on regular access to a pool. I could pack some shoes and shorts, though. Also, I remembered reading an interview with Johnny Marr where he said he always likes to run while on tour, that a jog in a foreign city early in the morning before anyone has woken up is the best way to get to know a new place. I will do anything Johnny Marr says is a good idea. 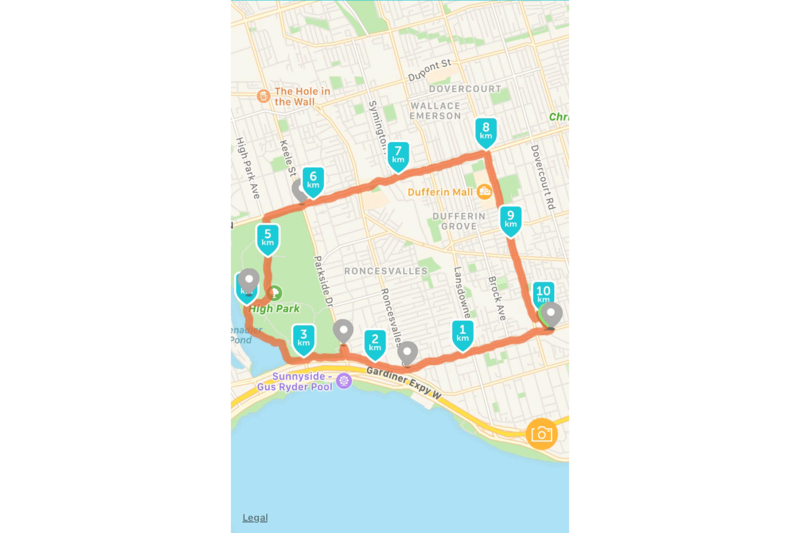 This is a little longer than my first actual Port Credit run, done later in the summer after I’d learned how to use running apps. A few days later, I set off on my first run in probably 5 years. 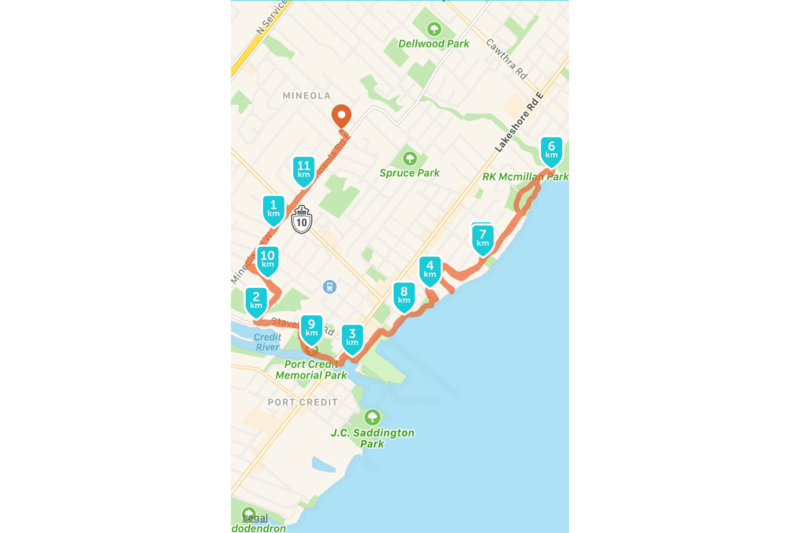 I ran from M.’s family’s house in Mississauga down to Port Credit and back. I didn’t want to listen to Back to Black again after all these years. I tried to think of some appropriately running-y music and came up with Neu!‘s debut album. This was the most brilliant decision I made all summer. Neu! is absolutely the best running music of all time. As I started off to the slowly building motorik pulse of “Hallogallo,” I knew the run would be amazing. The most amazing thing about Neu! (1972) as an album is that every song suggests a different phase of a run. “Hallogallo” pumped me up and got me going. “Sonderangebot” gave me a chance to cool down and gather my strength. “Weissensee” is cruising music. It finished just as I was approaching the shore of Lake Ontario, and then, in one of many transcendent moments of perfect Neu! soundtracking, when I hit the shore, “Im Glück” began, with its water sounds and seagull calls. I actually pulled my headphones out to see if that was coming from real life or from the record. I reached the end of my loop, turned around, and the song closed out with more aquasonics exactly as I headed back away from the lake. Then began the greatest running song of all time, “Negativland,” which got me pushing again with its jackhammer/bear scream/chanting crowd opening. Then, just as I was starting to get tired, and starting to near home, the song sent me into an absolute frenzy, with the indescribably incredible sequence beginning around 7:50 and peaking at 8:01. I defy anyone not to run like an absolute maniac for the minute that follows. I did, and then was caught gently by the whispery weirdness of “Lieber Honig.” It was 46 minutes of pure joy, an aesthetic as much as an athletic experience. If I hadn’t listened to Neu! that day, I might not have kept running. But, after resting my sore muscles for a couple of days, I did, as much as I could before we left for Europe. I bought another pair of shoes a few days later. I didn’t need them, but they looked too cool: Asics Gel Noosa with insane colours and weird graf writing on the side, a perfectly Japanese take on American street style. I bought size 10.5, which seemed too big, but they seemed to fit okay, and my size 9 Sauconies were starting to give me blisters on the ends of my toes, so it seemed possible they were too small. I packed the Noosas in my suitcase. We were off on a cruise from Copenhagen, and I remembered seeing people running around the deck on previous cruises. I had one of the best runs of the summer on the day we sailed out of Copenhagen. I remember circling the deck as we passed slowly out of the Øresund strait. The sun was setting and planes were landing at the Kastrup airport. On the way up the port side deck, the wind was in my face. On the way back down the starboard, I had a tailwind. After that first day, cruise running lost a bit of its shine. It seemed like every time I wanted to run, right before dinner, the crew was cleaning the deck. This was particularly problematic because I wanted to be able to eat several deserts, with Murakami’s conviction that it wouldn’t be an issue. Half way in to the cruise I discovered the treadmills in the exercise room. This wasn’t nearly as fun as running outside, but the machines were always available — and they had stats. As soon as I saw the stats, I knew I was really getting into trouble. It was tricky to find a machine that gave stats in kilometers, but once I had, I could see that I was able to run 10km in about an hour. I’d had no idea I was going that far — and although I was equally clueless about whether I was running fast or not, the distance seemed more important. I remember coming back to my cabin one night and asking M. if she knew how long a marathon was. She thought it was around 40km. I thought: Here we go. I could go that far. Running was officially a thing. After the cruise, we spent a few weeks with M.’s grandmother in Gorzów. Those were two of the best weeks of my life. We slept in, M.’s grandma made us a delicious breakfast, I went off to the beautiful Biblioteka Publiczna Wojewódzska i Miejska to work on my Superbrothers book, read an Agatha Christie novel in French during breaks in the Park Wiosny Ludów, came from around 5, M.’s grandma made us a delicious dinner, and we went for a run. 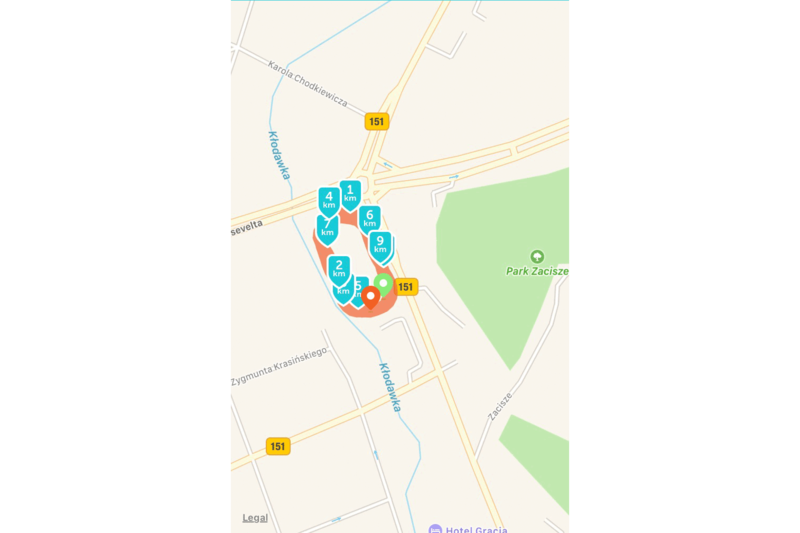 It was in Gorzów that I discovered running apps. I had no idea that my iPhone 4S could track my speed and location without needing any additional equipment. I had no idea that running apps were free. 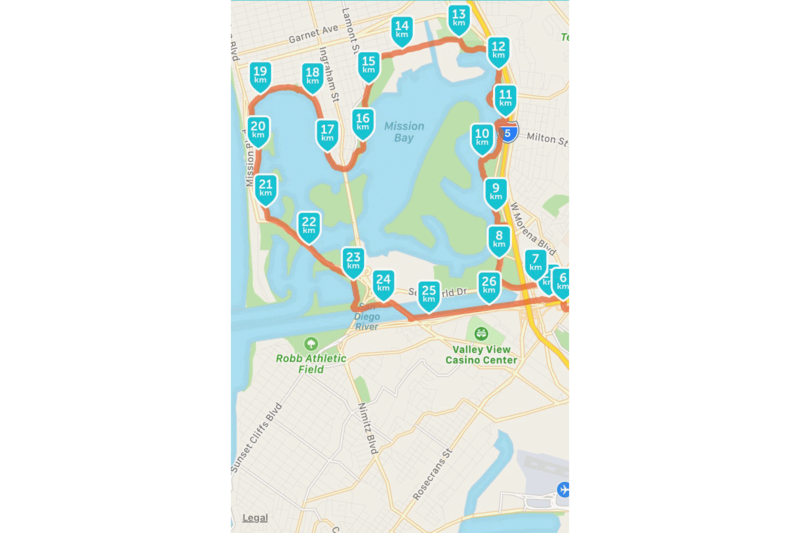 After reading some reviews, I tried Strava and Runkeeper and decided on Runkeeper. We did all our running at the huge Olympic-sized track near M.’s grandma’s place. 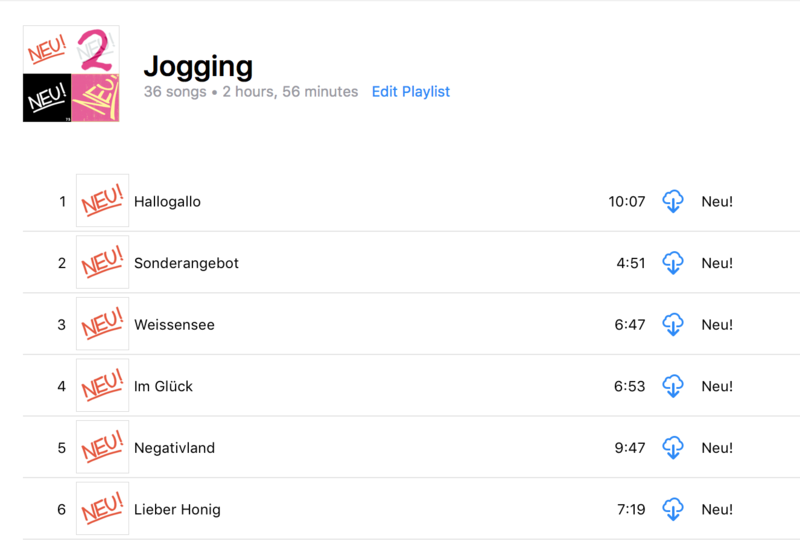 I would run the exact length of Neu!, sprinting during the crazy part of “Negativland” and trying to get as close as I could to 10km in the album’s 46 minute running time. By this time, I was able to maintain an average pace of 5:00/km or 8:00/mi. As you can see, GPS wasn’t always very accurate in Szczecin with my iPhone 4S. After those glorious two weeks, we went to stay with M.’s cousins in Szczecin. Her cousins are runners too, and they told me to head for the park behind City Hall. 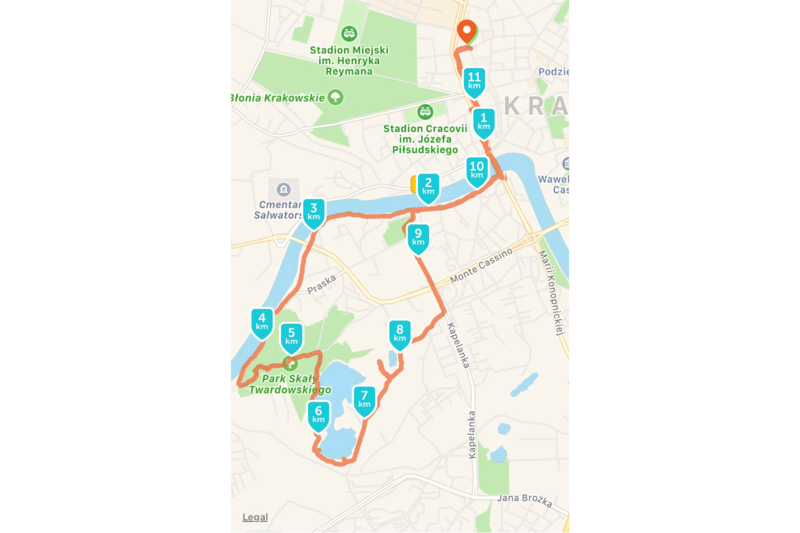 It was an amazing suggestion: I’d run there and then do a few loops in Park Kasprowicza around the Teatr letni. The course was hilly and challenging. iPhone in tow, I’d try to keep my average pace around 5:00/km (8:00/mi). Now I was running a little further: Neu! would end and then Neil Young’s On the Beach would start (not as good a running album, but I was obsessed with the title track that week.) 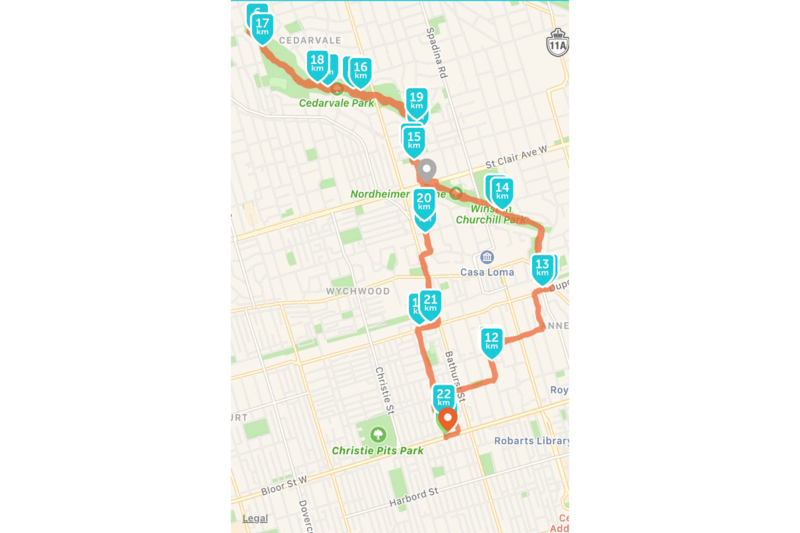 One day, I stretched my run out to 15km, with an average pace around 5:20/km (8:35/mi). Every day after I ran, I went and got a latte at Stojaki — the best latte I have ever had anywhere in the world (it’s the milk, I think), and incredibly cheap, like all things in Sczecin — and then had a huge vegetarian dinner at Greenway. It was hard to leave Szczecin. From Szczecin, we headed to Barcelona for another cruise. (If you’ve read this far without knowing that I write travel journalism, and that a lot of it is about cruises, for reasons that are mysterious even to me… well, now you know. I was on assignment, as usual, for the Globe and Mail.) The days were busy, but I again managed to spend some time on the treadmill. By this point, it really aggravated me that I couldn’t track my treadmill runs in Runkeeper. The addiction was growing. The treadmills I was on had a screen that would simulate a run through various parts of San Francisco. These simulated runs were nowhere near as pretty as the run I’d been doing the previous week in Szczecin. San Franciscan athletic imperialism was a drag. On the treadmill, I’d try to cover 12km in an hour, and I’d get really sweaty doing so. By this point, I was starting to realize that my beautiful size 10.5 Asics Noosas were actually probably too small for me. I have really long second toes and they were getting gross blisters. How gross? A few days into the cruise, I was offered a free “athlete’s pedicure” in the ship’s spa. I figured that, given the name, they’d be used to some gross toes. This wasn’t the case. The poor soul who gave me my pedicure said she’d never seen anything like it. She asked me the saddest question I’ve ever been asked: “Do you want me to pop your blister?” (My answer was something like, “Nah, that’s cool.”) I still feel guilty about that pedicure. By this point I could see how obsessed I was getting with running and was starting to imagine that I’d probably want to write a blog post about it at some point. 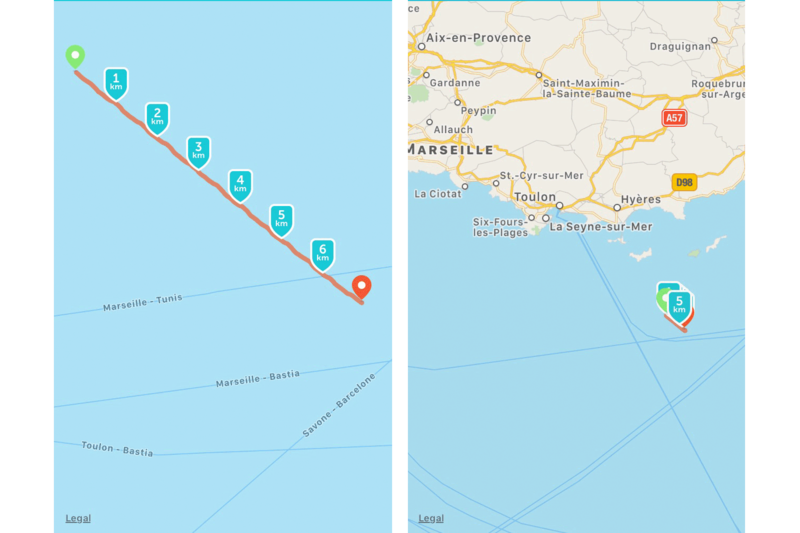 So I thought it would be funny to take a run on the deck of a moving ship and track it on my phone’s GPS, where it would look like I was running on water. Funny or not, that’s the shape above, zoomed in and out. Seeing that map reminds me of another significant thing. I’d made a resolution to do all my pleasure reading in French this year, and stopping in Toulon presented a great opportunity to pick up some books at reasonable prices at Fnac. I wasn’t sure what I was looking for, but once again, fate sent me straight for Murakami’s running book, whose much more appealing French title is Autoportrait de l’auteur en coureur de fond. I bought a copy, along with Chroniques de l’oiseau à ressort and some translations of Knausgaard, and spent a very pleasant afternoon reading the first 50 pages of the running book in a scuzzy cafe near the mall, watching the Tour de France stage where Chris Froome made his awkward daredevil descent down the Peyresourde. Somewhere in those pages, Murakami says that he runs at least 10km per day, at least 6 days a week. That was the first training regime I’d seen for running, so it became mine. I’d wanted to go for a run in Monaco, where I heard you can run into all sorts of famous athletes on their morning jogs, but I was too busy, and there was too much else to do. A few days later, though, I was able to join a great run organized by the Digital Humanities 2016 conference in Krakow. This was my first ever group jog. Shortly after, we were back in Toronto. I was staying with my former roommate in my old place for the first week, so I knew my way around the jogging options. 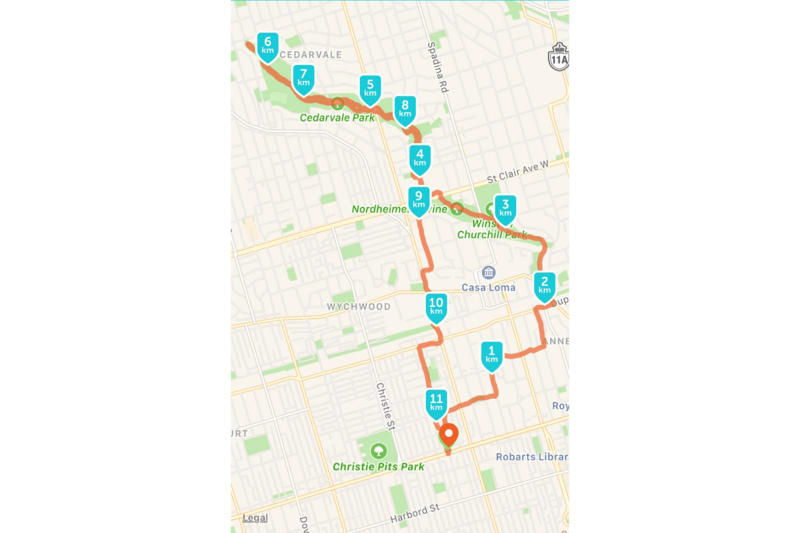 To keep up the Murakami schedule, I needed to add some distance to my old Back to Black route, so I extended the route across St. Clair into Cedarvale Park. It was a little over 11km and I was able to run it in about 55 minutes. I was happily running this route every day when my friend Nick wrote to ask if I wanted to come to Victoria in October to run the marathon. I hadn’t even thought about running a marathon that soon, but obviously the answer was yes. 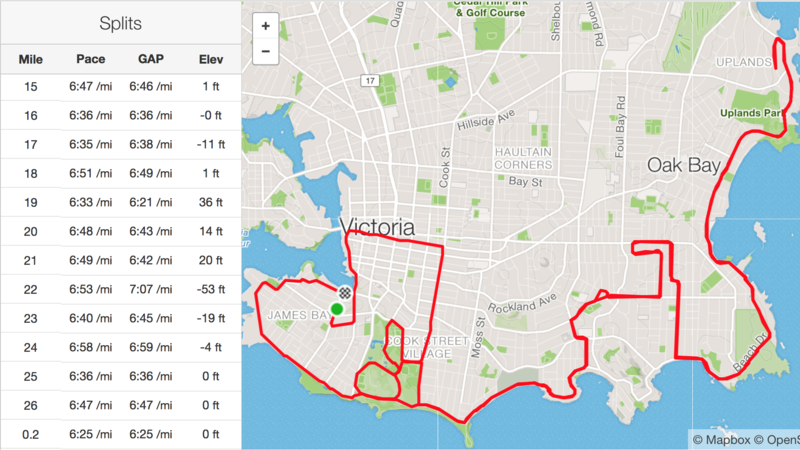 I registered and found a first-timer’s training schedule on the Victoria Marathon website. It was pretty late to start the schedule but I’d been running a lot, in however unstructured a manner. 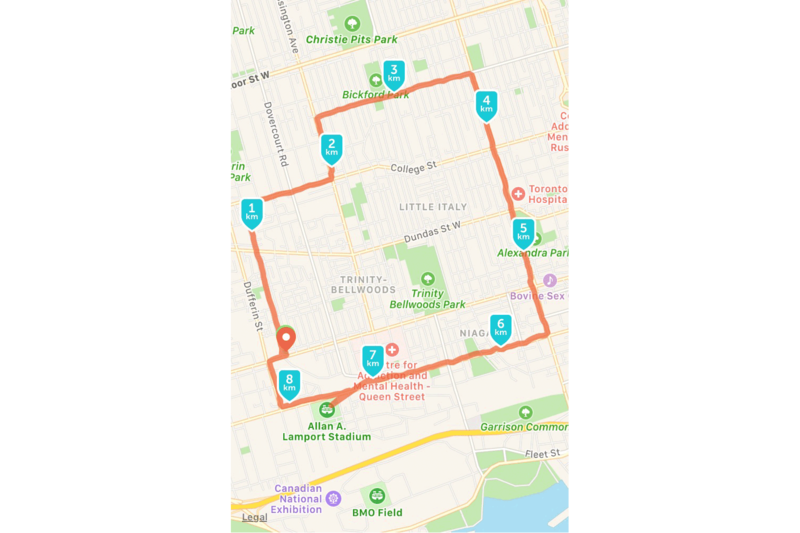 I did my first long run that weekend: two laps of my 11km circuit for a total of 22 deliberately slow kilometres at a pace of 5:32/km (8:54/mi). The shoes felt fine. I really enjoyed following the training schedule I found on the Victoria marathon website. It gave me a few days off each week, encouraged me to cross-train in the pool one day a week, and gave me a fun long run to look forward to every Sunday. A pivotal thing happened around this time, early August, by which point I was staying in a sublet around Trinity Bellwoods. It all happened in a very “me” way. The risk of getting obsessed with gear isn’t nearly as great in running as in my other great passions, cycling and guitar. There just isn’t that much stuff to obsess over: shoes, shorts, shirts, maybe a watch or a phone, sunglasses… and, well, hats. Sometime in early August I found out about Ciele hats — stylish running hats designed in Montreal (I still have no idea what the name means or how to pronounce it; it’s the Slovak work for “target,” which is appropriate for running, given all the pace targets you’re always trying to hit, but I suspect it’s something more related to ciel, French for “sky”). I am not a “joiner” by nature, and this is probably the only way I could ever be lured into going on a run with a bunch of people I don’t know. A cool half-priced running hat with free shipping is, for me, the ideally enticing carrot at the end of a stick. So I went. I read a bit about the club, who call themselves a “running crew,” not a “running club.” What’s the difference? Running crews are for hipsters, basically. They start their runs at the very hip Gladstone Hotel (where, I hasten to add, I once played a show with my band). When I arrived at the Gladstone that night, I saw that there were a lot of tattoos, plenty of quirky facial hair — and everyone’s shoes were way cooler than mine. Still, I’m not a hipster hater — it’s a label I’m happy to wear — so, sure, I was glad to find myself in a “crew” rather than a “club.” I was more interested in the actual running, though. I’d heard that the fast group on the long (10km) run sometimes went as fast as 4:00/km (6:26/mi). I hadn’t gone anywhere near that fast outside of my occasional one-minute-long-“Negativland”-bursts, so I planned on sticking somewhere in the middle. Much to my surprise, as soon as the run got going, I was able to keep up with the front pack. Even more to my surprise, I was able to stay with the front pack right until the finish (I think I came in 5th out of about 30-40 runners). This was a total revelation — it was my first evidence that I might actually be a good runner, something I’d had no reason to suspect before, since when you’re running alone your only point of reference is yourself. Looking at the stats in Runkeeper later that night, I saw that most of the kilometer splits were around 4:30/km (7:15/mi), a speed I’d never approached before, and the fastest split was an astonishing 4:09/km (6:41/mi). This all happened on August 9th. I vowed to be there again the next week. Of course, the next day, my body, which had never before approached such speeds, hurt. 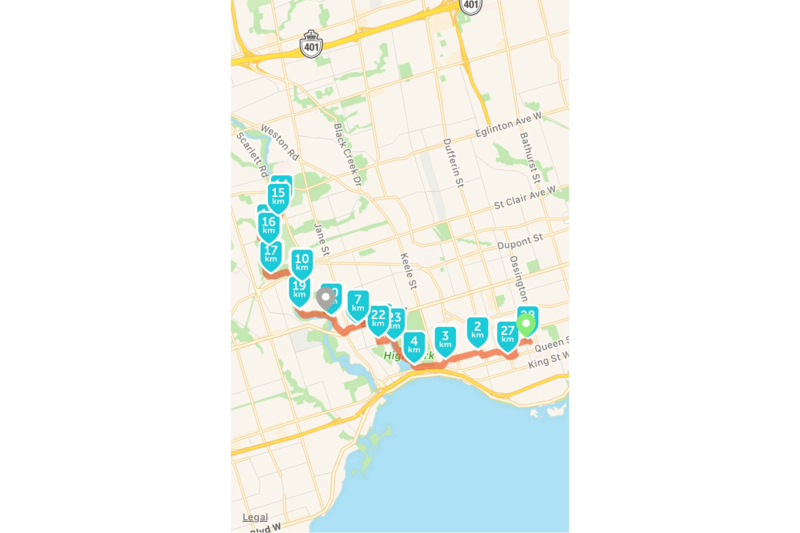 I had to skip a couple of days of training, during which period I learned all about “RICE.” But I did make my weekly long run, a really enjoyable 28km trek along the Humber run at a probably-too-fast 5:15/km (8:30/mi). The next week’s run with the Roadrunners was even faster. This time I really struggled to keep up with the fast group, and cursed them consistently throughout for running on the street when the sidewalks were free (stupid hipsters! ), but I managed to finish 3rd or 4th. It was a very painful 8.5km, but when I got back and checked the stats (which were slightly messed up by inaccuracies resulting from passing under a GPS-proof railway bridge), I saw that the average pace was around 4:15/km (6:50/mi). It was at this point that I started thinking that instead of just finishing the marathon, I wanted to do a decent time — definitely under 4 hours, Murakami’s personal threshold of respectability, and maybe around 3:45:00 or so. I wouldn’t have even contemplated this without the Parkdale Roadrunners. On my 30km long run later that week, I felt an annoying sensation in my right foot — like my sock was bunched up or something. I’d been feeling it for weeks, but it was way worse this time. When I took my shoe off, I saw that it wasn’t the sock, it was the shoe itself. Two parts of cushioning had gone out of alignment with one another and they’d created an uncomfortable ridge. Maybe I’d gone so fast on that week’s Parkdale run that I’d broken my shoes! Whatever the cause, I was sort of happy about this defect, since it meant I could return these shoes under warranty. Ever since looking around at all the stylish shoes worn by the Parkdale Roadrunners, I’d been reading up on my clunky New Balances, and found out that they were an uber-cushioned model with lots of special “support features” for “overpronators.” I won’t go into the details here, but this seemed like a weird choice for me, since I have high arches and my shoes wear more to the outside than the inside of the sole. I went back to The Runners Shop with a list of shoes I’d rather try instead — shoes that seemed like a better fit for my “neutral” running style and my new aspiration to do a decent time. When I went back in, a different employee said that her colleague was right, I’m an overpronator, and since it’s my first marathon, I needed super-padded shoes. I deferred to her expertise and took home the shoes she recommended, Mizuno Wave Catalysts — expensive, heavy, heavily padded shoes for overpronators. Once I had them home, I took a walk around the block and realized that they were bothering my right foot in precisely the same way that the New Balances had. The day after buying the Vazee 2080s, I went on another really long run, 32km. It probably wasn’t the wisest idea running that long on brand new shoes that were much less padded than my previous ones, but I survived, fueled largely by spite and rage. A few days later, I got on a plane to San Diego. I still had a bunch of long runs to do by this point — I was five weeks out from the marathon in Victoria. 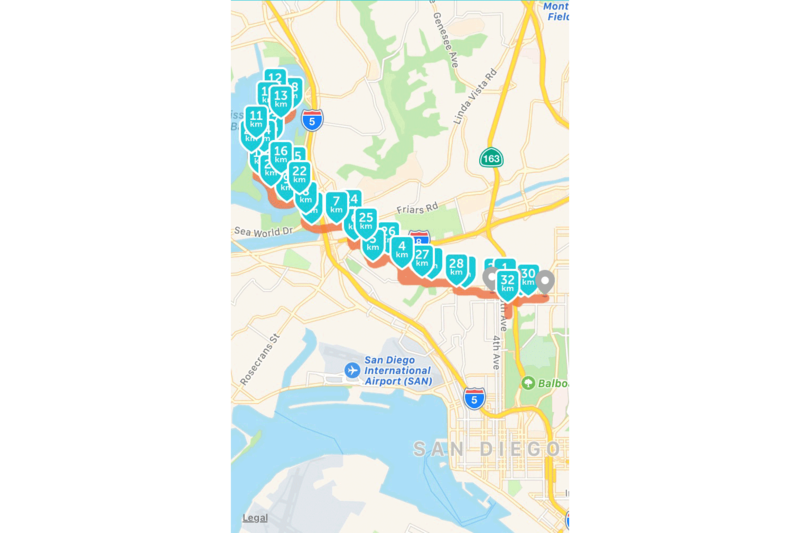 I asked some friends and did some reading and decided to try running from my house in Hillcrest through Mission Hills, down to the Presidio, and eventually to Fiesta Island for a few laps. This run was easily the least pleasant of my entire training schedule. Everything was fine until Fiesta Island. That place, it turns out, is less of a party than its name suggests. In fact, it’s a treeless post-apocalyptic wasteland filled with rickety RVs, with massive bonfires burning in hideous blackened pits at 8 in the morning. The fact that it comes up as a “green space” on maps is a travesty — it is 100% “apocalypse grey.” Running-wise, it’s awful too. 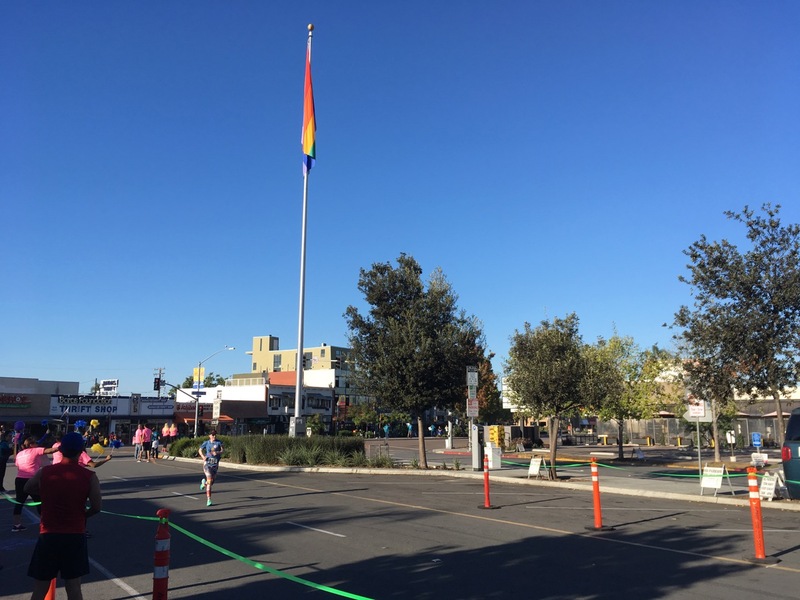 It’s relatively flat, but there are no sidewalks or running paths, so you’re dealing with cars, trucks, and (by far the best represented) rickety RVs. And the road is heavily pitched, so you’re never running flat, and your ankles aren’t happy. This was the run where I really started disliking the Vazee 2080s, which seem to deal especially badly with pitched road surfaces. Since I was now in the USA, home of insanely cheap online shopping, I took a risk with a pair of New Balance Fresh Foam Zantes that were on sale for $50. Somewhere around here, I came across the idea of 80/20 running. I read some articles online and decided to finish my training schedule using the “Level 2” program from Matt Fitzgerald’s book 80/20 Running. It seemed a bit risky to switch training programs at this point, but the whole idea of 80/20 running made sense, and the low-intensity approach seemed unlikely to lead to injury. The more of the book I read, and the more I followed its “pace run” and “mixed interval” workouts, the more I started to see that 3:30:00 was definitely within reach, and maybe I could go even faster. Last weekend was the moment of truth. My workout for Sunday was the “marathon simulator,” a 26.2km (not mile) run at target marathon pace. It’s only 60% the length of a real marathon, but the idea is for it to serve as a reasonable facsimile of the real thing, so that if you can run it at your target pace during the simulator, you’re not crazy for thinking you can extend that to the full distance. I decided to try running it at a 4:30/km (7:15/mi) pace — much faster than I’d ever maintained for that kind of distance, but something I was starting to think I could manage based on my speeds in shorter distances. Also, a 4:30/km pace gets you a 3:10:00 marathon finish, which happens to be the qualifying cutoff for the Boston Marathon in my age bracket. As it happened, 4:30/km was totally manageable. 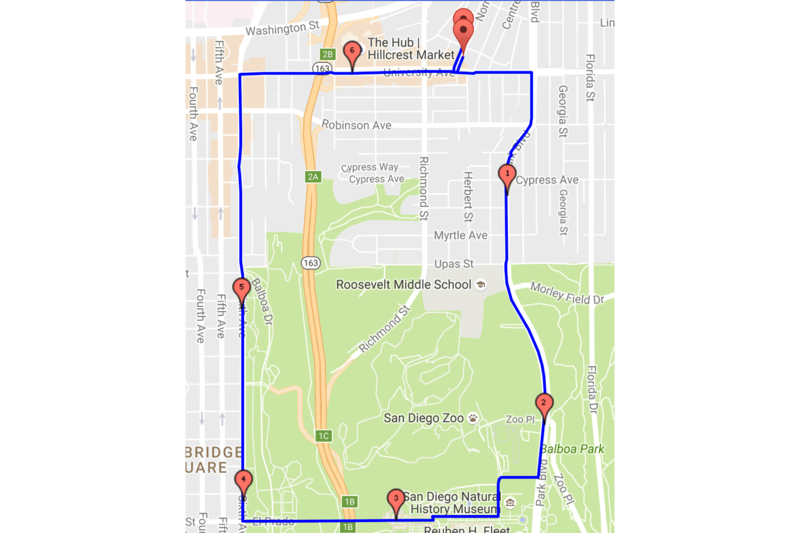 I got around my complicated 26.2km circuit through Balboa Park in under 2 hours, at an average pace of 4:23/km (7:03/mi). And my route was both hillier and hotter than it’s likely to be in Victoria, so I now think 3:10:00 is very much achievable — something I wouldn’t have considered possible a month ago. Which brings us to today. 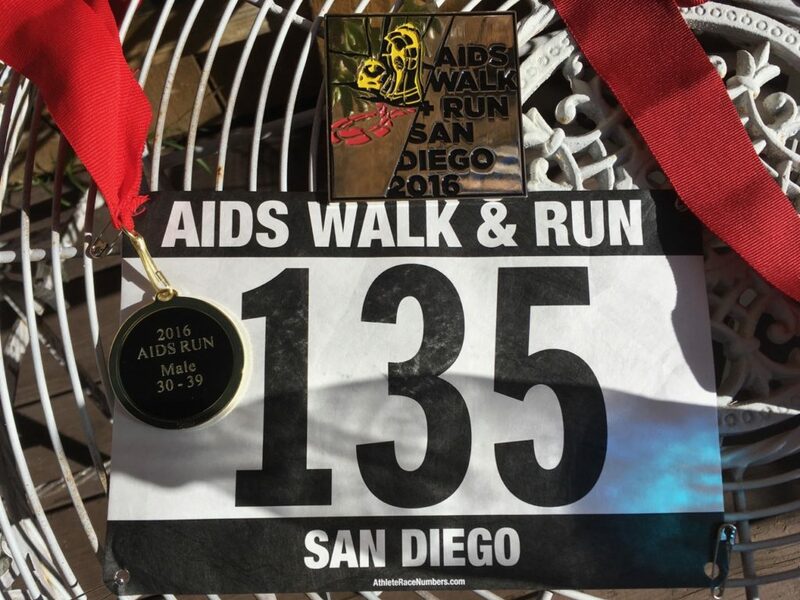 A few weeks ago, I decided to sign up for the annual AIDS Walk and Run San Diego. I wasn’t sure that a 6.5km race a few weeks before the marathon was a good idea, but the start line is right next to my house, and my dad lives with AIDS, so it just felt right. I managed to raise over $500 from my amazing colleagues at SDSU. I had no expectations for the race itself, but I was hoping to run it as a pace of under 4:00/km (6:26/mi). I woke up this morning at 6am, put on my Canada singlet and Canada socks, and my badass New Balance MRC5000v2 shoes, and headed out for a 2km warmup jog along the route. Even at that time, about an hour before the race was to start, the course was lined with whooping volunteers. Around 7am, I arrived at the start line and started doing some warmups. Another runner, also doing warmups, asked me what pace I was going to try for. I said “probably,” of course, because I had never done a 5k before — never done any kind of race, in fact. He seemed unimpressed and continued with his warmups. Later, at the start line, he told me he was just treating this as a tempo run. He was a 15 minute 5ker. He’d try to run a pace of 5:30/mile. Luckily I had no idea what that meant in min/km — because the answer, 3:25, is probably faster than I’ve ever run in my life over any distance. I said I’d try to stay with him for as long as I could. The race started, and he was off like a shot. Right away, I couldn’t keep up. I couldn’t keep up with him, that is — but, amazingly, one one else was in front of me. I couldn’t even hear any footsteps behind me. I was in second place. I was sure it wouldn’t last. I didn’t allow myself to turn around to check my lead and just tried to keep myself at a steady pace. The course is mostly downhill until halfway through, then it’s a brutal false flat all the way up 6th Street. I tried to save myself for that tough stretch. Totally unexpectedly, along the route I saw one of my students, who was volunteering near the right-hander off of Park. She was stunned to see me but gave me a loud cheer. “Second place!” I yelled. Seeing Angela was clearly a good omen. I still couldn’t hear any footsteps. I kept it steady through Balboa Park and up 6th. People cheered when I approached. I kept waiting to see if I would hear cheering for people behind me, but there was nothing. It seemed like I had a big lead on whoever was back there. 5:30/mile guy was barely in sight at this point, at least a minute and a half ahead. I just tried to keep it steady, down and up the dip near Pennsylania, around the corner at University, down to the bridge over the 163, up the equally brutal false flat to the finish line at Normal St., half a block from my house. Incredibly, I crossed the line second. Later, I got the medal for first place in the male 30-39 category. Before and after. 135 is a lucky number, I figure, since I’m 35. Obviously I’m not a silver medalist in many races. 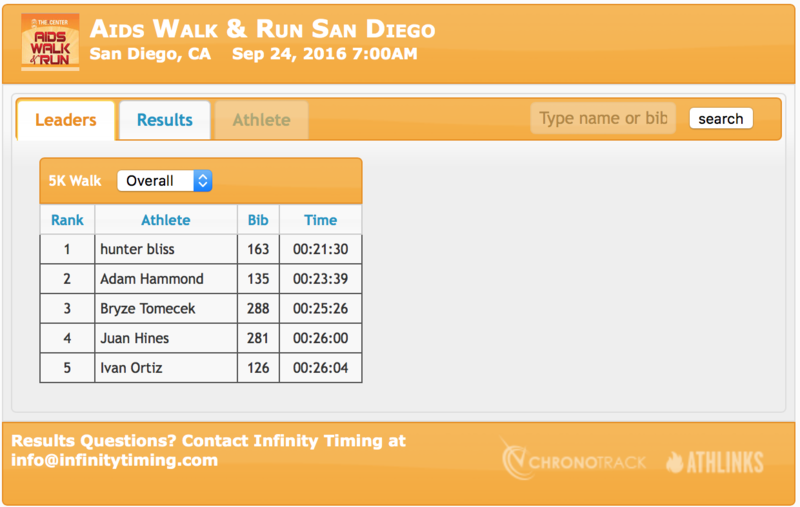 The fact that the winner — who beat me by 2 minutes — was treating it like a tempo run suggests the competition wasn’t particularly intense. But taking myself as the competition, the result was terrific. 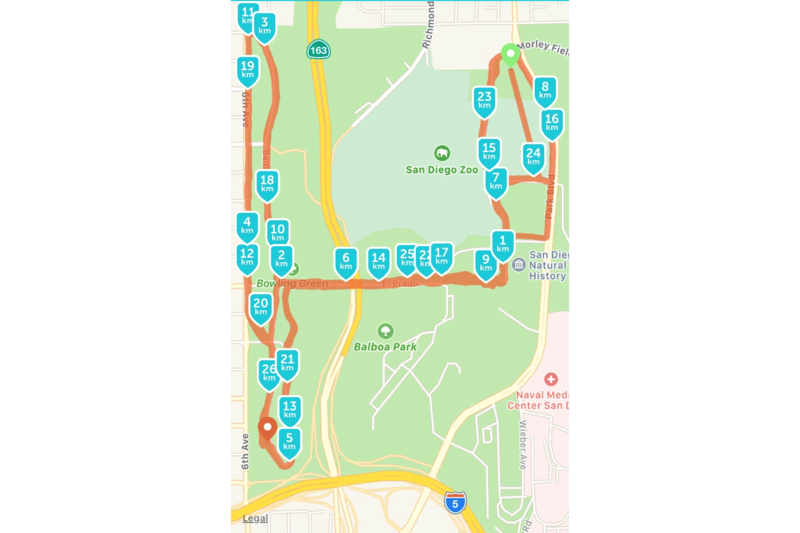 I finished in 23:39, and gmap-pedometer.com puts the course distance as a hair over 6.5km. That gives me an average pace of 3:38/km (5:51/mi), way better than I was hoping for. Plugging that into the McMillan Running Calculator suggests I might even be able to run my marathon under 3 hours — again, a shocking result I would never have dreamed of a month ago. Or a few months before that, when I wouldn’t have dreamed I’d be running at all. As I sit here writing out this incredibly long blog post, the Victoria Marathon is two weeks away. My initial goal was to finish. Then I wanted to finish under 4 hours. Then I wanted to finish in 3:30:00. 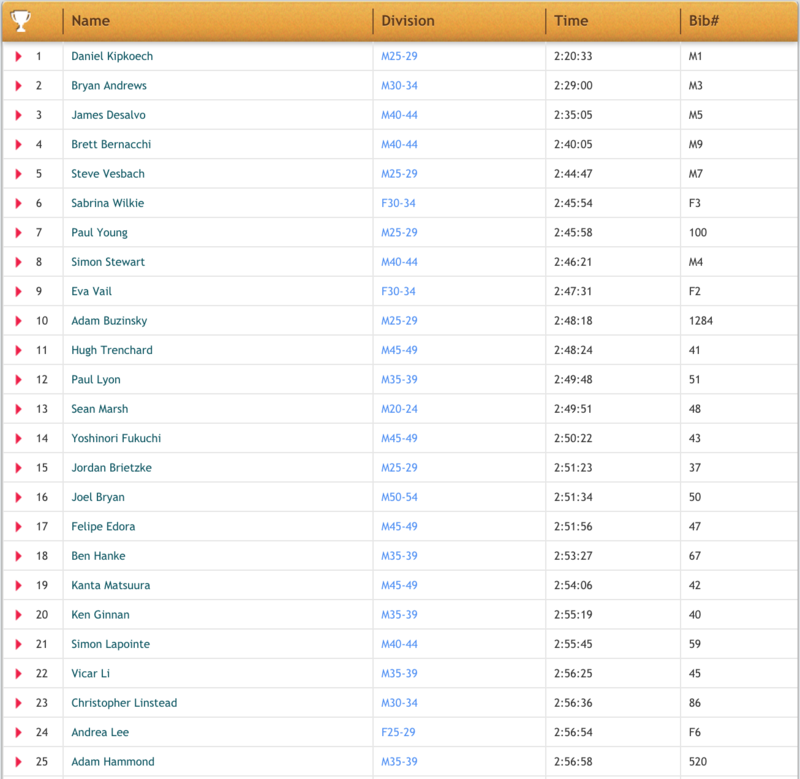 Last week, I’d have said I wanted to finish under 3:10:00. After today, I have a new goal. This goal has a name. I want to “Do a Neu!” Let me explain. Sometime earlier this summer, enamored as I was with Neu! (1972) as a running album, I experimented with running playlists made up of all the Neu! studio records. Neu! turned out to make great soundtracks not just for 46 minute runs but for longer runs as well. Neu! 2 is a pretty bad record, but somehow all those double-speed tracks and warbly nonsense is ideal for the 45:00-1:30:00 period, when you’re starting to feel a little wonky, but still powering through. Neu! 75 is an absolutely celestial record for the next phase. The opening track, “Isi” — the precise hipster version of “Chariots of Fire,” the anti-David-Foster David Foster song, the David Foster Wallace of running soundtracks — takes full advantage of the slightly lightheaded sensation you have by that point in the run and makes you feel like you’re actually an angel floating lightly over the pavement. The semi-apocryphal Neu! 86 is equally perfect for the last miles — a totally tasteless inflatable balloon of Euro-nonsense screaming “Dänzing!” in your ear at the exact moment when you just need a German screaming “Dänzing!” in your ear or you’ll fall over and curl up in a ball. The best thing about this absolutely perfect jogging soundtrack? The complete works of Neu! take up exactly 2 hours and 56 minutes — an extremely respectable time in which to run a marathon. That, therefore, is my goal for Victoria. I want to Do a Neu! (Obviously, I will be wearing my headphones.) According to the McMillan Running Calculator, my run today predicts a 2:55:04 marathon. So I have a whole minute to waste. One final thought after a short day of running and a long day of writing about running: The runner’s high is real. All through the summer, I’ve made the most of the periods of clarity, happiness, and patience that come after a hard run. I’ve edited, I’ve read, I’ve written. If M. has a story she needs edited, she always waits until after I’ve been on a run to give it to me. (Today, first thing she asked me when I got back from the race, before she asked how I’d done, was “What’s a better word for ‘zigzagging’?” Without a second thought, the runner’s high produced the correct answer: pinballing.) Generally speaking, I’ve come to agree with Murakami that running is a good thing for writers to do. But not just for the discipline, the structure, the toughness it instills — also for those highs. 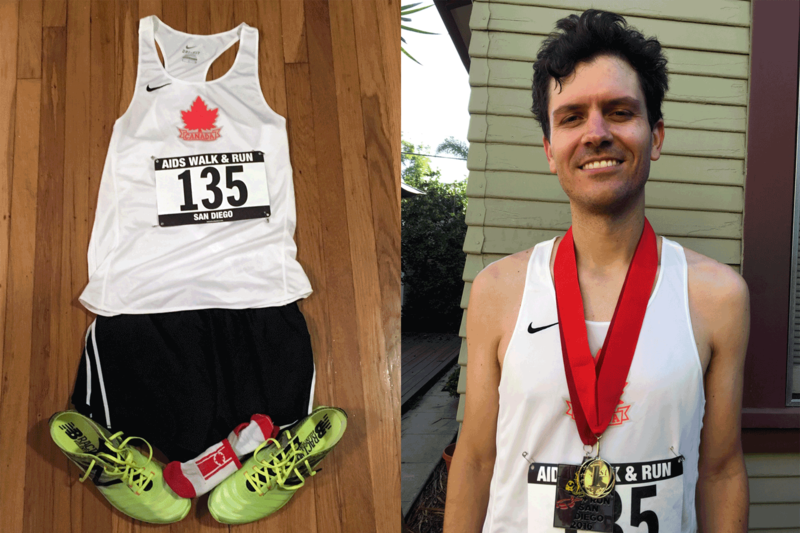 This post has been written in the course of a particularly long runner’s high that followed (a) running my fastest run; (b) running my first race; (c) coming in second and winning a medal; (d) supporting a good cause; (e) having a travel article come out that same day; and (f) watching Jose Bautista break up a scoreless tie with the Yankees in the bottom of the eighth with a huge 3-run shot. Because, well, it always comes back to baseball. 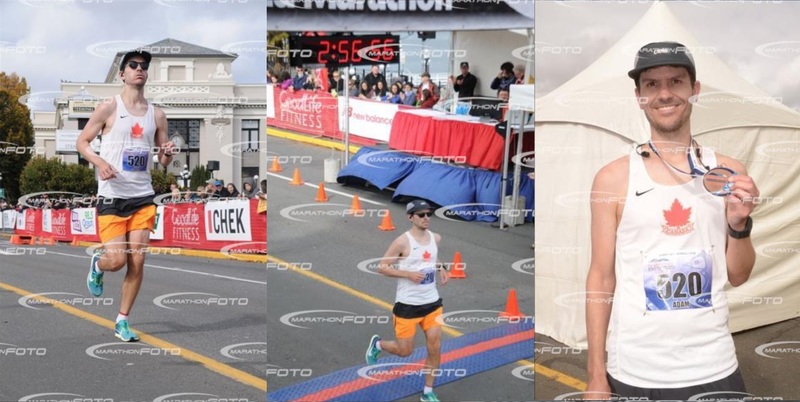 Well, my Victoria marathon went about as well as I could have hoped. I flew in on a Wednesday night, all set up for three full days of lounging and relaxing with my friends Nick and Erin. I’d ordered a TomTom Spark watch a few days before and this would give me plenty of time for me to get to know it as well. The weather forecast all through the week was for rain on Sunday. But on Saturday, the forecast changed: it would be 13C (around 58-59F) and cloudy with light winds and no chance of rain. So, absolutely perfect. We went down to the course really early, since Erin was running the 8K, which started at 7:15am. I didn’t sleep particularly well, and we were up at 5:30am (when the above left two photos were taken), but I was feeling fine. 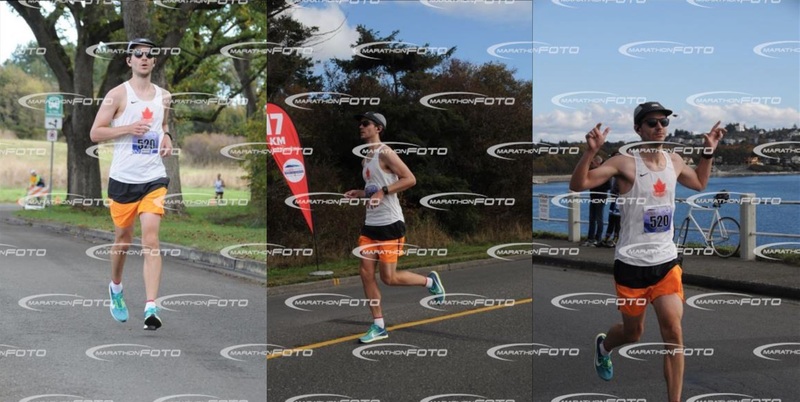 As you can see from the central photo above, I’d written three sets of split times on my hand: an “ideal projected split” (what the McMillan Running Calculator said I was capable of), a 3-hour split, and a Boston Qualifying 3:10:00 split. This proved sort of useless (sweat mostly washed them away, and my watch was a much more accurate predictor of my average pace) but was somehow a useful psychological exercise. At the start of the race, I concentrated on keeping my pace steady. I decided to set my watch to miles, since I’d gotten used to thinking of 4:10km/min as “really fast” over the summer and needed to run that for 42.2km. For the first half hour, I concentrated on keeping my splits (which popped up every half mile on my watch) as close to 6:41 min/mile as possible. But I also tried to be sure to take it relatively easy on uphills and to push on the downhills (the course is pretty flat, but I was always aware of either tilting down or uphill). I definitely noticed that most of the people around me were taking the opposite strategy, pushing uphills and dropping me, then taking it easy downhill and letting me catch up to them. I stayed with the same group of three or four people from about 5km to 35km, but we were seesawing like that the whole time, never actually running together. My strategy seemed like the smart one, but I wasn’t sure until that 35km mark, when I dropped the last of my companions and headed out on my own. That happened shortly before the photo on the right up there was taken, by which time I was obviously feeling pretty good (we’ll blame that pose on a lack of blood sugar). The only other big problem I had was accidentally taking my first gel when I thought I saw a water station in the distance, which turned out to just be a roadblock. I had to wait 15 minutes with half a gel burning its way through my esophagus. They need a water station in Oak Bay Village — there’s too long a wait between stations around there. I could feel that gel for another 24 hours. They’re not kidding when they tell you to take gels with water. As you can see from the central photo, I accomplished my goal. I wanted to run in 2:56:00, and I did (well, the uncharitable would round that up to 2:57:00, but I’ll just pretend that watermark is totally hiding the seconds — speaking of which, $70 for race photos? Geez). So I “Did a Neu!” in a sense. But in a truer sense, I didn’t. For although iTunes told me that the full cumulative length of Neu!, Neu! 2, Neu! 75, and Neu! 86 was 2:56:00, that last track totally ended at 2:42:00. Lesson leaned: don’t trust iTunes to add up the lengths of tracks. But although I was a little annoyed to hit my goal running to the repeated sounds of “Hallogallo” (who am I kidding? I love that song) this is helpful in giving me my next goal: doing an actual Neu! 2:42:00 will probably take a while, but it’s a fun goal. When I got back to Nick’s house after the run, he told me thought I crossed the finish line about 25th. Again, I was totally shocked. With 1,350 starters in the marathon, that would put me in about the 99th percentile. When the final results were posted, sure enough, 25th place, 5th in my age group. For reasons I don’t fully understand, I my official time was 2 seconds slower than the time on the clock. (I don’t understand this because I started pretty far back in the pack, and entered the course well after the time started counting up.) But hey, I’ll take it. Here’s a map of the course and some of my splits. For the most part, I kept it steady on flats, pushed on downhills, and slowed on uphills. My average pace was three seconds per mile slower than I was aiming for (6:44/mi, 4:11/km). I still can’t believe I pulled that off. I posted this activity to Strava if you’re interested. It’s now two days later. I was fairly sore Sunday night, and quite sore Monday morning, but I didn’t have any real trouble walking and, after drinking many litres of chocolate milk last night, I’m feeling pretty much back to normal today. Last night I plotted out my training plan for the LA Marathon. The marathon is on March 19 and my training starts in mid-November. I’ll see if I can sneak in a 5k before then. I’m totally addicted at this point, and dying to get back in motion. Also, because I can’t not mention baseball, the Blue Jays played Game 3 of the ALDS against Texas the afternoon of the marathon. The game started when I was on a flight from Victoria to Vancouver, and I listened to many nervy innings while waiting in the interminable line for US Customs at YVR. By the time I boarded my plane, the lead had switched many times, and it was tied 6-6. But given how the day was going, I had a feeling the Jays would prevail to sweep the Rangers. Sure enough, when I landed, there it was: 7-6 Jays, and on to the ALCS. What a day.